Costzon Infant Stroller 2 in 1 Foldable Baby Buggy Pushchair (Coffee) by Costzon at Baby Stroller Car Seat Combo. Hurry! Limited time offer. Offer valid only while supplies last. Description: A great baby stroller for your baby!! It can not only be considered as an ordinary stroller, but also a WARM removal BED for your baby! Description: A great baby stroller for your baby!! 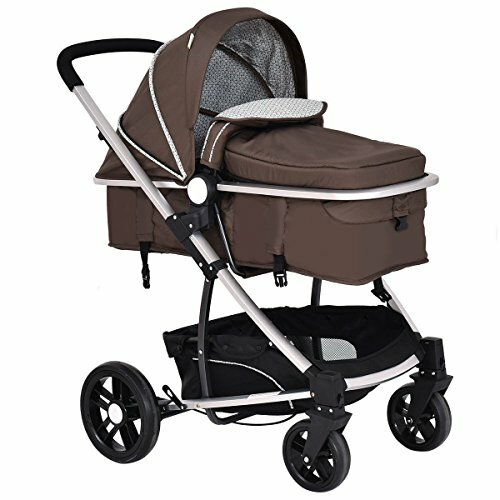 It can not only be considered as an ordinary stroller, but also a WARM removal BED for your baby! Equipped with a foot cover, which can prevent pitiless wind in winter to well protect your baby. When summer comes, you can remove the foot cover to keep your baby cool. It features a wide seat base and multi-position recline seat. Recline multi-position backrest with a convenient one-hand reclining adjustment, and extendable leg rest make it perfect for your baby. The fully adjustable canopy is designed to protect your baby from harmful rays.The storage basket underneath is ideal for holding purses, groceries, and diaper bags. 1.Simple assembly is required and you can refer to the instruction included..
2.Please consider the weight capacity before purchase. 3.Please fasten the seat belt when your baby sits inside. 4.Fit for babies from 0 to 36 months and no taller than 37.8". Five-point harness, one key to release quickly. Adjustable seats and shed, not only can sit but sleep, Seat also can be two-way conversion.